Oh Metro: Last Light, how great you were. I am finished the game and what a fantastic experience. It was way easier than Metro: 2033. I played them both on “hard”. The biggest difference is that 2033 felt much more desperate and ammo was far harder to come by than it was in Last Light. I always seemed to have piles of ammo in Last Light which really ruins the whole economy as well as how you approach combat. That said, Last Light is still an absolute blast to play. There is a lot to be said for not having an open world and controlling the narrative the way you want. I think Batman: Arkham Asylum was a better game than Arkham City because the devs were in control of how the game revealed itself to you and tight control of the pacing of the story. 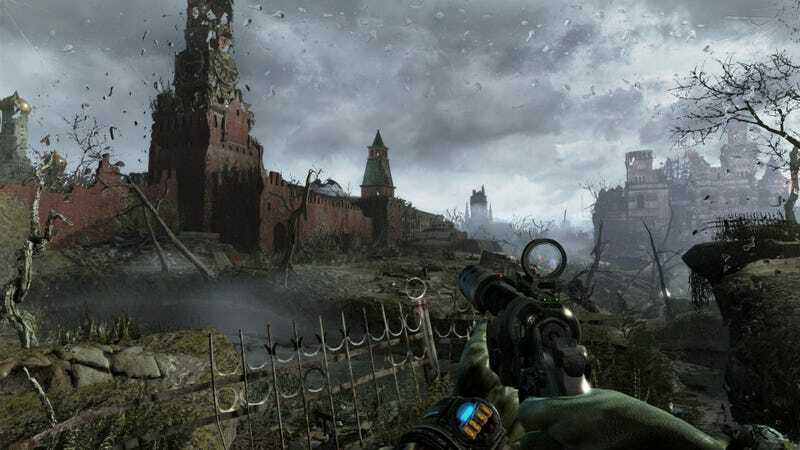 Metro: Last Light has a steady progression of environments, each more breathtaking than the one previous to it and each slowly unravels the story and mystery of the game. Highly recommended to PC users who have the hardware to really show the game’s full graphical potential. I don’t know how the console versions turned out, but full-out the PC version is visually staggering. Best rain storm ever. So, having Metro: Last Light polished off, I couldn't pass up Rathorial’s enthusiasm for inFAMOUS 2 and I'm several sessions in to it. Quiddity did a bang up job with inFAMOUS 2 as a Last-Gen Hero here, so I don’t need to go over what makes it a great game, but damn it is so much fun to move about in the game-space. Not only that, you move around so quickly that I was a little taken aback when I first started at just how fast the game runs. Sucker Punch really made a fantastic engine here, I’m totally getting a PS4 when Second Son comes out. Last-Gen Heroes: Infamous 2 : The Platformer is Dead! Long Live the Platformer! I do miss the origin-story aspect of the first game. I totally respect inFAMOUS 2 for actually being a true sequel, but I really enjoy the idea of becoming a god more than starting out as a pre-formed god. Other than that and no music adjustments in the options (am I the only one who hates when this option is missing? ), the game is really so much fun it is hard to pick out any faults. Even the most repetitive tasks in inFAMOUS 1 and 2 are fun just because of how fluidly you move through the world. I also had my weekly gaming session with my buddy and Dead Space 3 this week. My enthusiasm for the game is now gone. The latter sections of the game are a lot of copy-and-pasted levels and everything feels very similar to what we have done previously. LOTS of waiting in elevators plus ridiculous amounts of doors and empty, tiny rooms to move through with nothing at all interesting in them. They don’t even make sense architecturally. I think the game could have trimmed out a lot of extraneous fetch quests in similar environments and been a better game for it. We just started Chapter 15 out of 19 I believe. (they are LONG chapters). Hopefully it will get better quickly. Chapters 1-10 were pretty awesome though. And I played more Rayman: Origins this week. We are at what I think is a level or two away from the end, but damn the level we are on is hard. My son doesn't have quite the dexterity yet to do it as he is six and me being 42, I've noticed that my reflexes aren't quite as good as they once were. The level is also just damn hard too...I think we almost had it done a couple times, but we've done the level at least 30 times so far. Oh well, imagine how great we will feel when we complete it. So, with all the massive sales everywhere, what are you playing this weekend?